Jeffries has always been a leading manufacturer of stirrup leathers throughout the world. Stirrup leathers are one of the items of a rider's equipment liable to extreme wear, so that a high degree of tensile strength is needed. Selection of the leather to be used is therefore of the utmost importance. Jeffries use only the finest grades of stirrup butts, which are even thicker than normal bridle leather. Stainless steel buckles are sewn in with heavy gauge thread for additional security. 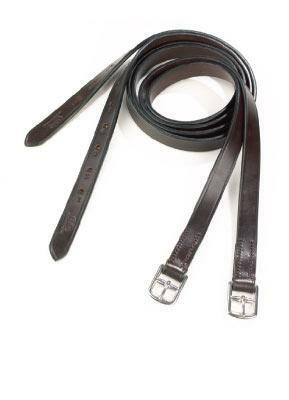 Jeffries offers stirrup leathers in different widths and lengths, in havana brown and black. The Jeffries range of stirrup leasthers also includes leathers for specific horse riding activities such as; dressage, polo and racing. Child riders have not been neglected, as Jeffries makes children's stirrup leathers in 36 and 48 inch lengths too. These Showing stirrup leathers are available in 36 or 48 inch lengths. They are 18mm (3/4 inch) wide i.e. narrow and made of fine leather with a nicely finished edge. They are therefore unsuitable for day to day horse riding and are designed for use in the show ring only. You can choose either havana or black from the pull down menu. Sorry no image available. To fit stirrup leathers, slide the metal loop onto the leather and locate the top hole of the leather on the prong. Then thread on the stirrup iron and bend the end of the leather upwards. Push the end under both bars of the metal loop, adjust to the desired length and finally locate the correct hole onto the prong and pull. These classic fillis horse riding stirrups from E. Jeffries' Eldonian range are available in a wide range of sizes (choose from pull down menu). The stirrups are supplied complete with treads which saves you the nasty job of fitting the treads.